This entry was posted on 14th August 2014 by Tom Richardson. KE Adventure Travel, for whom I was leading a trek around the range crossing its high passes, describe it thus. "The southern edge of the Central Asian republics is defined by the rocky barrier of the Pamirs which includes the little-visited Fann Mountains. This spectacular range has numerous snow-capped 5000 metre peaks and the potential for brilliant trekking, through rocky valleys and across high passes. Accessed through the Tajikistan capital, Dushanbe, the sensational 12-day trek makes a comprehensive tour of this rugged and picturesque landscape, where Tajik shepherds graze their flocks on remote upland pastures. Climbing to many high passes and viewpoints, including the dramatic Mazalat Pass (4133m) and enjoying a succession of superb lakeside camping places, this is a truly memorable trek. After the trek, we travel into neighbouring Uzbekistan, where we visit the stunning Silk Road cities of Samarkand and Tashkent. More than 2500 years old and known as the 'Gem of the East', Samarkand is one of the wonders of the world, with mosaic-clad monuments that are guaranteed to take your breath away. This is Central Asia at its best!" Chimtarga (5489 m) is the highest peak in the Fann Mountains, located near the Mutnye Lakes. However I managed to rename them Murky Lakes, due to glacial outflow and my poor Russian. 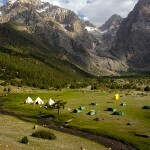 We camped at the Murky Lakes towards the end of our circumnavigation and climbed the scree and snow Mazalat Pass above. It is the highest of the seven major passes on the route. Nearby Chimtarga on the other hand has no trek-up route to the summit. The ascent routes start either directly from the Lakes or by crossing over the even higher and more technical 4750m high Chimtarga Pass, which lies between the peaks Energia (5120m) and Chimtarga. The established climbing routes on it vary from Russian grade 2 to 6 on both rock and ice. The known routes were all first climbed by Russians between 1936 and 1984. The potential for new lines both here and across the whole range is almost unlimited. We saw very few other people throughout the trip. However there are two former Soviet Mountaineering Schools in the valleys and we met three or four small climbing groups in the Chimtarga area and one trekking group. On a distant and low rock ridge I saw a group on a multi pitch climb. It was definitely, ahem, peak season. We had a friendly local guide, cook and an interpreter. The gear was carried on donkeys supervised by 7 donkeymen. The food was traditional Tajik including lots of fresh veg and strangely loads of melon. On behalf of the group I declined the customary bottle of vodka on the dinner table every night! Access to and from the mountains was by a four wheel drive vehicle. Although at the end of the trek even they could not get up the newly “improved” road up the narrow Bodhona Ravine. To reach our final campsite, we had to get out and walk. This was probably a considerably less scary finish to an amazing trip.